Listing all posts with label cats. Show all posts. 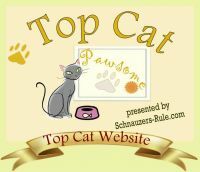 Which is Worse, Fleas or Flea Control? We all know the problems fleas can cause for your cat. Flea dermatitis is the most common, but if left unchecked, fleas can cause dehydration, severe anemia, and spread parasites such as tapeworms and other diseases to other cats, and even to humans. 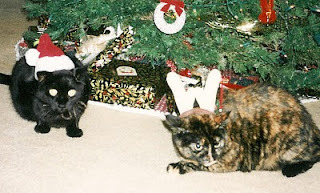 We've been in the holiday season for a few weeks now, and different cats cope with it differently...just take a gander at the faces on my two when they were dressed up for this Christmas photo several years ago! There are many dangers for cats to be found in holiday decorations and goodies, as well. When I heard about Jason Sadler's business, IWearYourShirt.com, I thought, "Brilliant!" This guy gets companies to sponsor him every day of the year, and he wears a T-shirt with their logo on it wherever he goes that day, whether it's to the mall, traveling, or to speak to a group at a conference. A common belief is that cats groom themselves so you don't need to bother with grooming them. While it's true that most people don't take their cats to the groomer's like dog owners do, cats do need occasional help with grooming. 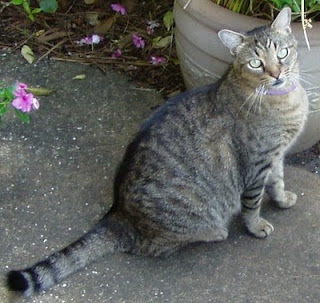 Regular brushing or combing helps control shedding and hairballs. 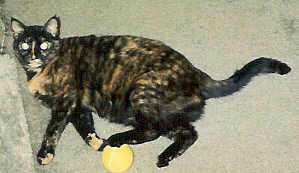 Always on the lookout for new stuff for our kitties, we'll be attending the Global Pet Expo next weekend in Orlando. Pre-show publicity says that over 800 new products will be debuting there! 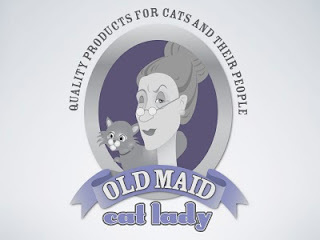 Granted, not all are for cats, but we'll be telling you about every one of the new cat products we find, and hopefully will also be able to feature many of them on OldMaidCatLady.com. Stay tuned for all the news! Valentine's Day has never been my favorite holiday, and 2009 made it even less so. I spent that at the emergency vet clinic with our darling little Frankie, shown here, who was breathing very shallowly and seemed to be swollen through his chest area. As it turned out, Frankie was in the final stage of FIP. Now, that's funny! We old maid cat ladies have always thought our cats were worth their weight in gold, and now we know that others share that opinion. Personally, I've always wondered about the intellectual capacity of someone who would mail off valuable gold in the hope that someone they've never met before will actually mail money back to them. It just seems like an arrangement that's a little too easy for some con man to set up as a scam and have lots of people mailing their gold to him without actually sending them anything in return. 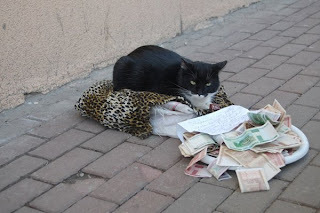 I found this story about a cat who begs for money on the street in Russia on another blog. All of us old maid cat ladies know that our feline friends seem to "know" when we've rescued them, but this one seems quite amazingly aware of his situation. When a story about me and my 21-year-old cat ran on the front page of the local newspaper recently, one of the comments to the online version said, "There's nothing worse than an old maid Cat Lady." After initially feeling insulted, I started to see the humor in the moniker. I mean, seriously, who uses the term "old maid" any more to refer to a single lady of a certain age? Certainly nobody I know.